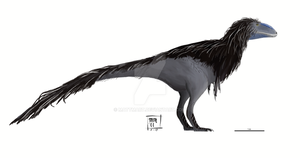 Final digipainting of Deinonychus in environment. Rather than the cliche of hunting in a pack (which is only very weakly supported by evidence, it's more likely these dinosaurs mobbed prey in loosely coordinated groups like modern birds and reptiles), I've done a lone Deinonychus fleeing in the lumbering wake of another predatory dinosaur, the carcharodontosaur Acrocanthosaurus. Recent studies have shown that the wing and foot claws of dromaeosaurs were ideal for climbing trees, a behavior probably restricted mainly to juveniles in larger species like D. antirrhopus. But that probably wouldn't stop a near adult Deinonychus from attempting to climb as high as it could to avoid the attention of a 6 tonne sauropod killer as it passes through a gully in search of fresh water. Why would a Deinonychus fear another apex predator that is too big to be interested in it? Considering the only larger predator than Deinonychus was too big to eat it I don't think anything hunted Deinonychus. Cannibalism in theropods appears to have been common and at the famous Deinonychus "pack hunting" site there is evidence of Deinonychus feeding on both juvenile Tenontosaurus and each other. Actually, most of the preyed upon tenotosaurs were juveniles, to the point that at least one paper has focused on Deinonychus being the main source of Tenontosaurus juvenile mortality. Forster, C.A. (1984). "The paleoecology of the ornithopod dinosaur Tenontosaurus tilletti from the Cloverly Formation, Big Horn Basin of Wyoming and Montana." The Mosasaur, 2: 151–163. Says that most Tenontosaurus remains found with Deinonychus are half-grown individuals. They are still way to big to have been taken down by single Deinonychus. I never said they were taken down by a single Deinonychus, though some of this evidence does seem to suggest a feeding frenzy. I object to the word "pack" because it's very specific. Using it implies two things: Social structure and relatively stable membership. There is no evidence of such things for Deinonychus and I doubt we would ever be able to know for sure if any given prehistoric animal was a pack hunter. I would describe the evidence as pointing toward "group feeding" or at best "group hunting". We can't know the level of coordination here, though the instances of cannibalism suggest it maybe was on the low side. A lot of predators (crocodiles, sharks, etc) are capable of both mob feeding and true cooperation. But a Deinonychus is too small to offer nourishment to a 6-ton predator (remember it's only about the same mass as a person). I can see Acro targeting 400kg ornithopods (small enough to be easily caught, not too small to be not worth the effort), but not a 75kg dromaeosaur. Because the others would not allow themselves simply to be eaten? I still think if an Acrocanthosaurus wanted an easier meal than a sauropod it will target Tenontosaurus, not Deinonychus. Nothing allows itself to be eaten... Of course Acrocanthosaurs probably targeted mostly iguanodons and small sauropods, but to say that they never attacked or fed on Deinonychus just because it was small or potentially aggressive is a bit short sighted. A big, relatively unintelligent carnivore like Acrocanthosaurs would probably have attacked anything smaller than itself that couldn't easily hide, from tenontosaurs to juvenile Sauroposeidon to Deinonychus to juvenile acrocanthosaurs. And modern examples don't tend to bear out your suggestion that Deinonychus would not have hidden or fled from close-approaching acrocanthosaurs. Small birds and mammals fly and hide from me when I walk through the forest and I'm reasonably sure humans are not regularly attacking them. Why are you calling Acrocanthosaurus unintelligent? Because of its small brain? That has no bearing on intelligence. Considering most if not all predators seem to be highly intelligent regardless of brain size, no reason to call anything stupid. Why couldn't an acro kill a deinonychus because of competition reasons? Unfortunately, that's not close enough... if we looked at Komodo dragons we'd find the same evidence (note that we've also got Deinonychus bite marks on Deinonychus bones, which implies it was more like a feeding frenzy or predator trap than a pack hunt). Wow I really like this scene ! Indeed a 6 tonne killer is a real motivation to climb a tree, despite maybe a size that make this activity not very easy. As it's usually said "fear gives wings"
This is gorgeous Matt, and from an angle rarely attempted. Bravo good sir. Thanks! Actually this is in the queue for a version 2. Gonna try to tighten everything up and add a bit more detail. I'm specifically unhappy with the Acro, the enants, and that bloody fern. Gotta get this painting into shape for a new project. I like this pic. Have you read "Raptor Pack"? I ask b/c this pic reminds me of a similar pic by Skrepnick ( [link] ). "Rather than the cliche of hunting in a pack (which is only very weakly supported by evidence,"
Among good sources (E.g. See the following quotes, which are just in reference to adult-only clumps, not to mention multiple shed teeth & brains), it's generally agreed that said evidence makes pack hunting much more likely than not. "it's more likely these dinosaurs mobbed prey in loosely coordinated groups like modern birds and reptiles),"
I know you're referring to Roach & Brinkman 2007, which (AFAIK) was poorly received by good sources (especially after Li et al. 2007). This makes sense, given said paper's many problems, which I'll list in another comment if you want. Quoting Holtz ( [link] ): "Did dromaeosaurids hunt in packs? That seems to have been the case with Deinonychus at least. 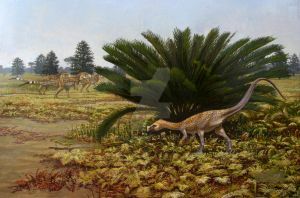 There are several examples of fossil quarries where many individuals of this species were found buried with a single skeleton of the large iguanodontian herbivore Tenontosaurus. While this could be because the dromaeosaurids were scavenging in a group when they got buried, some evidence suggests that this is not the case. Specifically, no one has found a similar grouping of many Deinonychus together with a single skeleton of Sauropelta, the ankylosaur that also lived in the same environment. It seems that packs of Deinonychus would attack the larger, but mostly defenseless, Tenontosaurus rather than the heavily armored Sauropelta." …group hunting by adult Deinonychus Raptors is a viable hypothesis. It’s not the ONLY hypothesis but still, I think, the strongest one." Bakker believes in pack hunting! I'm shocked! The problem is that when people say pack hunting they generally think of wolves. Finding several specimens of a predator together is meaningless without context. There's no way to know how coordinated or persistent these groups were. we know for a fact that dome dromaeosaurs lived together in groups. We don't know anything beyond that. Calling such a group a "pack' is very misleading to people. You could just as easily say Komodo dragons are pack animals because they work together to bring down large prey. Nothing in Holtz' quote contradicts that. Bakker has a real tendency toward hype and trying to hyper-sensationalize dinosaurs, so take anything from him with a grain of salt. "The problem is that when people say pack hunting they generally think of wolves." To be fair, pack hunting raptors have a comparable social structure to pack hunting canids (See page 4 for the best example: [link] ), so it'd make sense if the same went for pack hunting dinos (I.e. Eudromaeosaurs), given that hypercarnivorous dinos probably had a comparable social structure to hypercarnivorous birds (See the Bakker quote). "You could just as easily say Komodo dragons are pack animals because they work together to bring down large prey." Actually, you couldn't b/c what Komodo dragons do (I.e. Mobbing) isn't at all cooperative (See the King et al. quote; I know that it's in reference to crocs, but it describes the same behavior). However, I do understand what you're getting at: Group hunting isn't necessarily pack hunting. Specifically, there's true cooperative (I.e. Pack) hunting & pseudo-cooperative (I.e. Communal) hunting in reference to vertebrates. My point is that while the adult-only clump, multiple shed tooth, & trackway evidences could be interpreted as being for either pack hunting eudromaeosaurs or communal hunting eudromaeosaurs, combining them w/the brain evidence (See the Gardom & Milner quote) makes pack hunting eudromaeosaurs much more likely. Sorry for not making that clear in my previous comment. "Bakker has a real tendency toward hype and trying to hyper-sensationalize dinosaurs, so take anything from him with a grain of salt." Again, I do understand what you're getting at. However, the Bakker quote in my previous comment isn't a sound bite from some TV interview (E.g. When he describes T.rex as a "roadrunner from hell"), but the conclusion of his science blog post in which he describes the circumstances of YPM 64-75: Big difference. Besides that, guys like Bakker & Witmer (among a few others) seem to know more about living animals than do many dino paleontologists (E.g. As you can see in "Raptors – Group Hunters or Cannibals?" & "Dino Gangs: solitary, communal, or cooperative hunting in tyrannosaurs", they don't synonymize group hunting w/pack hunting as do many dino paleontologists), so if anything, guys like them should be the go-to guys when it comes to comparing dinos to living animals (which, in addition to their charisma, explains why they're so popular among dino documentarians). Quoting Bakker (See the 2 paragraphs w/highlighted words: [link] ): "Three hours north of our Lakota quarries we have sites from the end of the Cretaceous, sixty-six million years ago, when that most famous of dinosaurs, T. rex, played the top predator role. The great tyrannosaurs are cousins of the raptors, and the tyrannosaur data matrix helps us look into the mind of the raptor. My colleague from the Black Hills Institute, Pete Larson, has discovered a remarkable thing about the gender roles in rex. The biggest, most powerfully muscled specimens are female, as shown by the structure of the bones around the base of the tail. Female dominance is a powerful piece of evidence that permits us to reconstruct the private lives of Cretaceous predatory dinosaurs. A family structure built around a large female is rare in meat-eating reptiles and mammals today, but it's the rule for one category of predatory species — carnivorous birds. Owls, hawks, and eagles have societies organized around female dominance, and we can think of tyrannosaurs and raptors as giant, ground- running eagles." Quoting King et al. ( [link] ): "Gans (1989) asked the rhetorical question, "The few observations on food acquisition by crocodilians are mostly serendipitous ... Do the few reports on cooperation represent accidental events or part of a more general phenomenon?" Cooperative feeding is quite different from the non-cooperative, feeding frenzy that is seen when groups of wild crocodilians devour fish trapped in drying pools or captive ones are fed at a single location in a farm or exhibit enclosure. In such free-for-all situations, the animals fight for food, injuries may occur, and smaller individuals often are excluded until the dominant animals are sated and move away." Quoting Gardom & Milner ( [link] ): "When the first Deinonychus fossils were found in Montana in 1964, scientists noticed that there were the remains of several of the predators near the body of a much larger herbivore, Tenontosaurus. Did they hunt in groups? Certainly Deinonychus' brain was relatively large and probably well developed in the areas vital to a pack hunter, namely those of sight and sound. Bringing down a big dinosaur would have provided several days' food supply, even if it had to be shared." I'm not arguing that they likely hunted in groups. That much is obvious from the taphonomy. But none of those quotes (nor any actual, you know, data or evidence rather than arguments from authority) suggest that they were packs or pack-like, specifically. Thanks! I doubt adults climbed habitually, but it's not imposible for them to have scaled large trunks at least. And this one's meant to be a subadult anyway. The idea of juvenile Deinoychier living arboreal I do like more and more. Awsome composition! Um, what version of photoshop did you use for this? Version 7 comes under this, does it? I absolutely love that you are depicting Deinonychus as an aboreal creature! *arboreal, I always spell that term wrong. Hey Matt, this, like a lot of your newer stuff, has a great composition, light colours and ideas behind it. I really like what you're doing. But, on the other hand, they all look completely unfinished. This looks like a fantastic underpainting, but not a final version. Which is frustrating, because as I said, your paintings are really awesome in a lot of ways. I think you need to force yourself to spend something like three times as long on them. Cleaning up edges, smoothing out brushstrokes, and adding detail to some of the non-dinosaur parts of the painting (or at least the same sort of detail, it looks like with a lot of the them, the dino was drawn in pencil, which gives it a different feel to the rest of the picture). It reminds me of Dan Benson's work, a lot of originality, nice ideas, but just let down at the end because of lack of finishing. I'd be right pleased with myself if I had come through with some of the ideas and compositions you have in your work, but then I also would have finished the damn paintings! Thanks for the feedback! Yeah, I have a real recognized problem with my patience when it comes to these complex digipaintings, to the point where I tend to settle for 'eh, good enough for me' and then get it on dA without a second look. This invariable leads to me looking at it the next day and noticing heaps of things I wish I'd worked on longer. Granted I've done about 5 "real" attempts at actual environments, and I'm still learning the ropes (what is this, "underpaitning," thing? ), but I'll definitely try to force myself into an extra day or so's work and maybe even re-visit this one since I'm pretty proud of the composition if not the execution. The wing looks kind of translucent, is that on purpose? I don't know if you overdid it, it's just something I noticed. Can you even find a reference for something like that? Hmm, I couldn't find a backlit wing with an object behind it. Pics like this make me think your eyeball guess is plausible, but if there was enough sunlight to make the wing see-through, the feathers would look a bit more "glowy". Good find! Will have to save that pic for future ref. One of your best scenes so far. I have a feeling you could do even greater work in traditional media, but hey, that's just my bias. It's beautiful. I really love the composition. Kind of tempted to buy a print of this! I absolutely love this image. Its almost like a window to the early cretaceous. Keep up the excellent work.